If you like messing around with electronics, one of the best tools you can have on hand is a solderless breaboard. These handy little chunks of plastic just let you “plug n play” so you can quickly develop a circuit before committing it to solder and fiberglass. Handy as they are, they do have their downsides such as: stuff not fitting, split up power rails, running out of jumpers or just taming what can quickly become a birds nest of a mess. 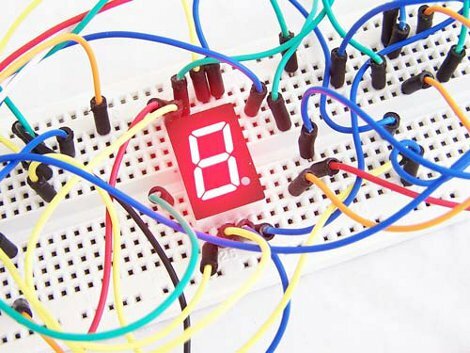 Luckily the folks over at [Proto Stack] have published a handy article giving us 8 Breadboard Hacks. While anyone that has used breadboads for any length of time will have probably figured most of these out, its still good knowledge for any newcomers to the sometimes aggravating world of plastic and jumpers. Also we know there are more hacks you can do to make your lives easier and would love to hear them in the comments. Either it’s a bad link or their server is having capacity issues. The link has been slashdotted/hackadayed. 2. Ask him if you can have all the wires cut-off from old ballasts, or the extra in new ones (people like me hate the mess & cut off quite a few inches when installing the new one). 3. Have breadboard jumpers for life in white, black, yellow, red, blue. Sometimes purple. Better yet make friends with some working for the telephone company, beer works well there as well. A boat load of color flavors. Hmm. Between 730am and 800am eastern on Sep 20, protostack.com was down. Would have like to see it. It caught my attention because I have my own page on breadboard tricks: http://www.dansworkshop.com/2011/09/breadboarding-modules/ Hopefully protostack comes back up soon, I wanna see it! Keep the wiring structured and neat. It takes longer but it’s a hell of a lot easier to debug. I found that any of the CATx cables have wire that is great for breadboarding – also, most indoor telephone wiring. I found that any of the CAT3/4/5 cables have wire that is great for breadboarding – also, most indoor telephone wiring. You get a wider variety of color stripe combinations from the old 25-pair phone cables. They were used on most office phone systems for many years. Here’s some breadboard tips from Instructables website. Soldering microswitches to 2×2 pin headers makes adding push buttons to test circuits very easy, and they’re sturdy. I’ve also soldered some miniature DPDT push switches to some 2×3 pin headers and also two 1×3 pin headers with a gap so it can be plugged into the middle of the breadboard. Twist ties work the best for bread boarding, just strip both ends, they can be bent about 1000000000000000000000000000000000000 times before they break and are super cheap, the plastic coated ones look better than the paper, but both work. A piece of cat-5 will give you a life-time supply of color-coded solid wire jumpers. Yeah, but you’ll need the catx-cable that one usually puts into walls. Thats the one with the one-wire cores…the less flexible one. Usual patch-cable won’t do because of the multiwire cores. That’s the flexible one. Dunno but I still prefer the 18GA 105 degree C rated wire in ballast wiring to CAT-5, most of which (except newer manufacture) isnt even plenum rated. I know it’s only a breadboard, but I love overkill. Protostack is probably on a shared-hosting service. They need to move to the cloud !!! Some good ones in here that I can vouch for. Someone needs to design a programmable breadboard, with switches mounted on the case to connect various rows instead of jumpers. Good idea there, but jumpers are faster and easier to debug than coding stuff up; and by doing so, how would you convert the wiring when you want to finalize it? Not sure of they are the same since protostack is down. Site is back up. Sorry about that. Haha, I’ve definitely done that micro-SD card hack before. The best tip I know of is to use square post, wire wrap machined pin sockets. You can pop the pins out of the socket base (throw that away) and use the square pins in the breadboard. Your bread board will last forever (the square pins are a perfect fit) and you can inset components into the “socket part” of the pins. Over sized resistors even. if you don’t want the expense of the strips, you can sometimes find an old Wire Wrap board on eBay. These were generally made by Augat or somebody. And have thousands of pins. It’s work to remove the wire. But if you look, you can find them “new” with no wires. I have a life time supply of those gold pins from one board. Oh Yeah, you can also insert wire into those pins, cover the joint with some heat shrink, and make those fancy dancy little jumpers you see in the photo. Lasts a long time too. I use them for switches and buttons. Now I just pick up a button, and stick it on the board. no more trying to fit the switch or button on there, they automatically fit. Between my site and HAD I think we melted Protostack’s server down. The teaser page on my site saw close to 10k visits yesterday. yea well you can add another 18 thousand and some change here! I usually link one of the power buses to the main one with a resistor for projects that use multiple LEDs. Saves attaching a resistor to each LED. Doing something like this can be pretty handy, so, for that reason, I wouldn’t permanently link the buses. I’ve made my own jumpers and test leads with male header pins and female sockets from old computer cases. Remove all plastic from the male and female, then solder the male into the female and heatshrink. Makes a very durable plug. Staples work great as jumpers. A little heat shrink tubing can be added as insulation if you want, but for power and ground I don’t usually bother.